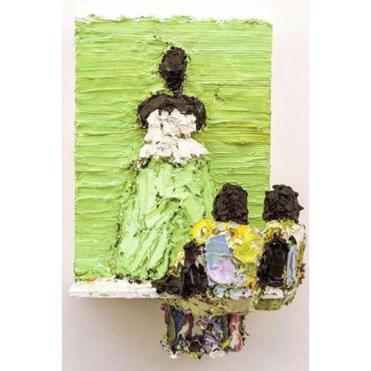 “Duchess in Green” by Lavaughan Jenkins, one of four James and Audrey Foster Prize Artists. The Institute of Contemporary Art has announced 2019’s James and Audrey Foster Prize Artists: Rashin Fahandej, Lavaughan Jenkins, Josephine Halvorson, and Helga Roht Poznanski. Established in 1999, the Foster Prize provides funding for artists and culminates in an exhibition for the winners. It will showcase contemporary Boston-area artists and their respective practices, and open in August. Erickson consulted curators, artists, and other colleagues. She previewed more than 150 artists’ work online and scheduled 50 studio visits before the four recipients were selected for 2019. While Halvorson, Jenkins, and Poznanski primarily create visual art, Fahandej, 40, works with multimedia. Fahandej’s most recent project, a multiplatform, multilayer research and collaborative work titled “A Father’s Lullaby,” combines video and audio components. His sculptures are made with layers of oil paint instead of clay, with a wire, paste, and plaster structure to help support the weight. The idea was to “delve into the realm of: What’s a painting?,” according to Jenkins. The other Foster Prize recipient, Poznanski, 91, is also currently painting, but she’s worked with a variety of media in the past. Once a fashion designer in New York, she began studying visual arts at the School of the Museum of Fine Arts when she and her husband moved to the Boston area. Her current focus is on abstract watercolor, which she handles in an innovative way, by painting with transparent watercolors rather than opaque, and using very little water. This creates a strong pigment, which she uses to make shapes for her abstract artwork. Although Poznanski fled her native Estonia in her teens to escape Soviet oppression, she credits her “very colorful” paintings with growing up in a northeastern European country, where the “national costumes” are also full of color. “The colors probably come from there because I’m accustomed to seeing artworks in Estonia as a child,” Poznanski added. Unfamiliar with the other prize recipients, she’s done some research.